The Nets took advantage of opportunities in Game 5. The Brooklyn Nets won Game 5 by the same formula that worked for them in their series-opening win against the Chicago Bulls. Let’s take a closer look at how the Nets staved off elimination. With Kirk Hinrich out of the lineup in Game 5, Nate Robinson drew the start and was the primary defender on Deron Williams. Williams was 6-for-10 shooting and scored 19 of his 23 points when guarded by Robinson in Game 4. Williams shot 33.3% (13 of 39) when guarded by Hinrich the first four games of the series. Williams joins Jason Kidd as the only Nets player in last 25 seasons with multiple 20-point, 10-rebound games in single postseason. The Bulls are 41-23 when Hinrich plays this season and 7-16 when he doesn’t. The Nets scored 54 points in the paint in Game 5 and have now eclipsed 50 paint points in both of their wins against the Bulls this series. They shot 67 percent in the paint in those two games. Brook Lopez finished with a career playoff-high 28 points. He’s scored 20 points or more in all five games in this series, the longest streak by a Nets player since Vince Carter had eight straight 20-point games in 2007. 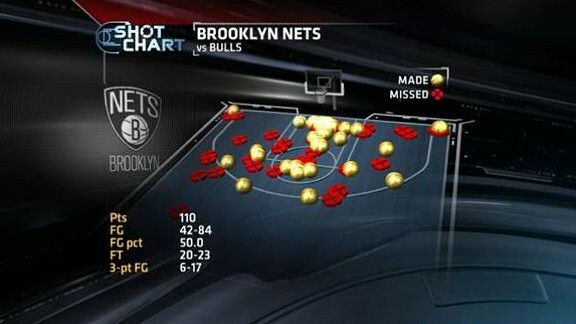 The Bulls allowed 24 second-chance points to the Nets in Game 5. That’s the most second-chance points allowed by the Bulls in a game this season. The Bulls have never been forced to a Game 7 in the dozen previous instances in which they led a best-of-7 series by a 3-1 margin. They won in five games eight times and won in six games the four other occasions. The Bulls loss did keep this stat intact: They have not won four straight games (or lost four straight) at any point this season.